If it’s true that the best time to buy is at the bottom, then now might be a good time to buy Crypto currencies, especially Bitcoin, which has undergone a dramatic plunge in value over the last year. But will crypto prices fall further? Crypto currencies have lost more than $400 billion off their peak values in late 2017 and some analysts are claiming that now is the best time to buy, because the bloodletting appears to have ended and prices have stabilised. 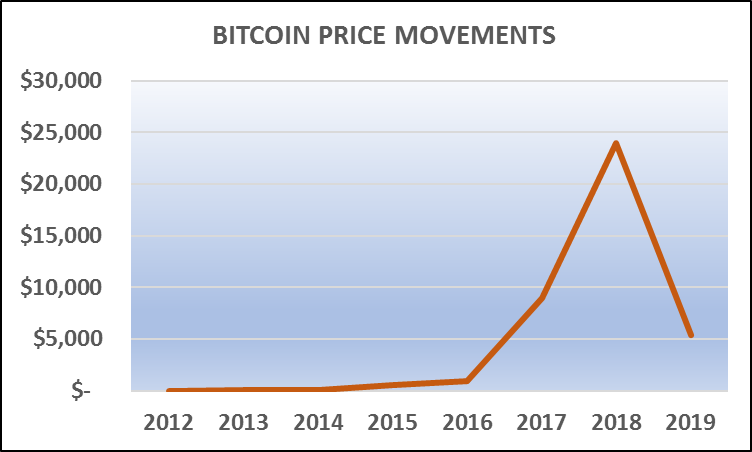 The chart shows how Bitcoin prices have moved since the boom started in 2016, with prices dropping dramatically since early last year. In fact, the Bitcoin buying craze had all the hallmarks of a boom-bust scenario, being enthusiastically embraced by a whole new generation of investors for all the wrong reasons. “Bitcoin is high tech,” they told us. “It’s innovative, it’s blockchain based and best of all, it’s disruptive.” Given this sort of talk, demand was always likely to evaporate once the novelty wore off and the cracks appeared. Now the supporters of Bitcoin are claiming that recent price falls are due to “market volatility” despite the fact that Bitcoin was somehow supposed to be immune from such dramatic demand related price shifts. Other analysts have come up with the term “crypto winter” to describe the current lack of demand for the commodity. While this describes the phenomenon, it does nothing to explain why such a freeze out of buyer enthusiasm has occurred, or whether we will ever experience another crypto spring. The facts are that Bitcoin is a commodity and must therefore follow the laws of supply and demand like all other asset classes, but this seems to confound its proponents. To keep the commodity viable, they need continued demand, so they are now expounding the long-term benefits of buying bitcoin. They are playing the long game, as the saying goes. This strategy will sound familiar to followers of the property market where prices have been falling as they have in Sydney and Melbourne. The focus of the discussion quietly shifts from recent high performance or promises of imminent growth to the fact that prices always rise over time, that they are at the bottom of the cycle, and those who play the long game will still be ahead. Yet Bitcoin is an asset that is quick and easy to trade, and must suffer from high price volatility as a result. It was never designed to be a long-term investment like property, so it is really interesting to hear the Bitcoin barrackers change their tune completely, and now refer to Bitcoin as a buy and hold asset. I know which I would rather be holding during the tough times, because in ten years’ time Bitcoin may just be a historical quirk, but property will still be a valuable asset.